The Global Volcanism Program has no activity reports for Mallahle. The Global Volcanism Program has no Weekly Reports available for Mallahle. The Global Volcanism Program has no Bulletin Reports available for Mallahle. Mallahle is the central of three NE-SW-trending stratovolcanoes (along with Asavyo and Nabro) in the Danakil horst SW of Dubbi volcano. These volcanoes, plus Sork'Ale, form the Bidu volcanic complex. 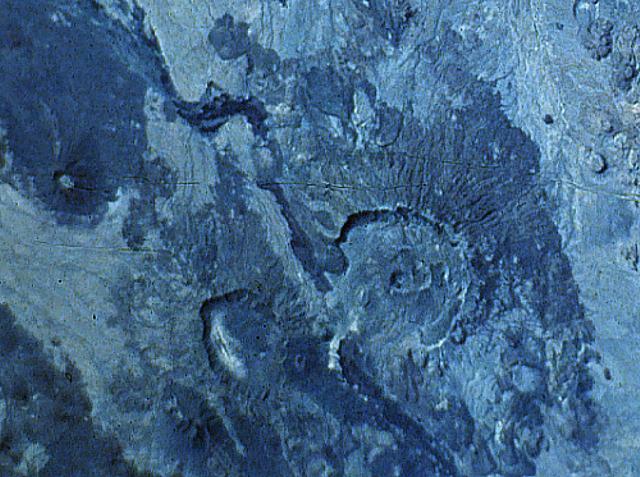 The complex stratovolcano is truncated by a steep-walled 6-km-wide caldera, and is formed of rhyolitic lava flows and pyroclastics. Basaltic lava flows blanket the slopes. Recent obsidian flows are found on the NW flank, and older obsidian flows were erupted on the northern caldera floor. Flank spatter and scoria cones are most numerous on the western side of the volcano. Extensive ignimbrite deposits associated with the collapse of Mallahle and Nabro volcanoes blanket the countryside. Wiart P, Oppenheimer C, 2005. Large magnitude silicic volcanism in north Afar: the Nabro volcanic range and Ma'alalta volcano. Bull Volcanol, 67: 99-115. Wood C A, 1980. (pers. comm.). The Global Volcanism Program is not aware of any Holocene eruptions from Mallahle. If this volcano has had large eruptions (VEI >= 4) prior to 10,000 years ago, information might be found on the Mallahle page in the LaMEVE (Large Magnitude Explosive Volcanic Eruptions) database, a part of the Volcano Global Risk Identification and Analysis Project (VOGRIPA). There is no Deformation History data available for Mallahle. There is no Emissions History data available for Mallahle. The smaller (left-hand) of the two large calderas at the bottom center of this NASA Space Shuttle image is Mallahle. The steep-walled 8-km-wide caldera truncates a stratovolcano formed of rhyolitic lava flows and pyroclastics. Basaltic lava flows blanket the slopes of the volcano, and flank vents are most numerous on its western side. Mallahle lies SW of the larger Nabro caldera (right-center) and is the central of three NE-SW-trending stratovolcanoes in the Danakil horst SW of Dubbi volcano. NASA Space Shuttle image S-61A-36, 1985. There are no samples for Mallahle in the Smithsonian's NMNH Department of Mineral Sciences Rock and Ore collection. Large Eruptions of Mallahle Information about large Quaternary eruptions (VEI >= 4) is cataloged in the Large Magnitude Explosive Volcanic Eruptions (LaMEVE) database of the Volcano Global Risk Identification and Analysis Project (VOGRIPA).